This 8 Year-Old Amputee Uses Dance As A Powerful Way To Say "Never Give Up"
This story is sure to give you ALL the feelings today! It’s stories like this that reiterate why we do what we do here at GTHQ – because there IS good in the world and it deserves to be shared just as much as all the other news, if not more. 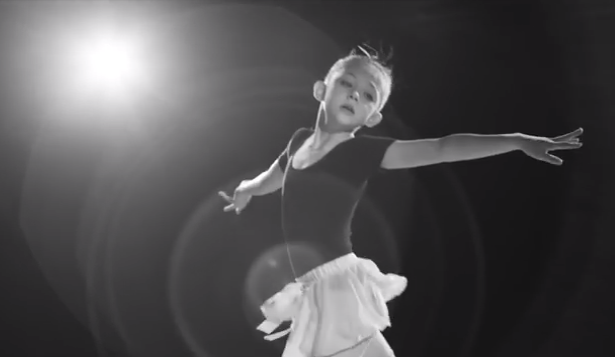 Alissa Sizemore is an 8 year-old dancer from Utah, but she is using her art form to inspire her audiences unlike most other dancers. Her incredible journey actually started with a horrible accident in May of 2014. She was playing in her neighborhood with a friend when she ran past a garbage truck which was rolling to a stop. Unfortunately it didn’t stop in time and ran over her right foot severing it. She was rushed to a hospital in Salt Lake City by plane but the doctors couldn’t save her leg despite trying everything they could. Eventually they had to amputate it below the knee. Alissa’s mother told People magazine in an interview that having to explain to her young daughter that she would never get that part of her leg back again was a heartbreaking conversation. Alyssa’s parents, despite being divorced, were determined to give their daughter the best chance at life even though they knew she would have a rough road to recovery. “I knew that she was very determined and never gives up. She’s always been like that. I told her, ‘Whatever it takes, you’ll get through this. With or without your leg, you’re still the same person.’ ” said dad Philip. Alissa’s town rallied around this brave young girl and raised funds for the family to afford a prosthetic limb as their insurance didn’t cover it. 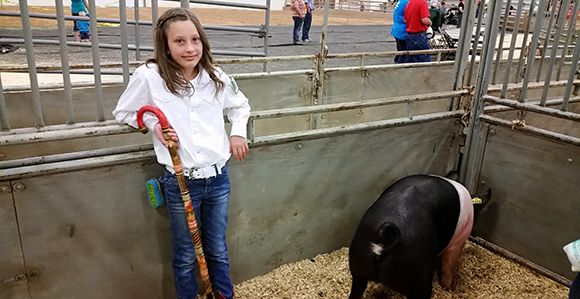 One young girl named Lily Wilson, 11, even sold her pet pig at an auction for $10,000 toward the cause! Before she even received the prosthetic leg, Alissa had already been planning to return to dance and once she got the prosthesis she started slowly practicing her moves in the studio her dad built at his house. She told her family she was determined to participate in the February 2015 recital at her school and began rehearsals in September the year before. “Alissa never gave up and never even skipped a beat. She’s shown an incredible amount of courage, determination and motivation to be the same little girl she has always been,” said one of her teachers Taunia Wheeler who helped her prepare for the dance. Her mom Heather also made sure Alissa knew that there was nothing in life she couldn’t do just because she was an amputee. As for that recital in February, oh it went ahead and Alissa not only captured the hearts of those in attendance, but also over 200,000 more people around the world who have viewed the video Heather uploaded to Youtube. It seems fitting that she danced to Colbie Caillat’s ‘Try‘, a video all about empowering women to embrace who they are, flaws and all. Her performance left many in the audience in tears, not to mention all of us watching it online! But it is also a powerful reminder of the strength that lies within. Surrounded with the right support and encouragement to be her best, Alissa was not only able to dance again, but has now been given an even bigger platform than she would’ve had before the accident. It reminds us a little of double amputee and Paralympian Amy Purdy who in a TED Talk described how losing her limbs to bacterial meningitis at the age of 19 was a devastating blow as she thought she would never snowboard again. Today, not only is she a champion snowboarder, but has started her own prosthetic company for other amputee athletes and is using her story to inspire not just amputees, but literally every person to know that the barriers they face in life can either be seen as just that, or a launch pad into something great. Alissa may only be 8 years old but already her story captured the attention of many people, including music trio Gentri from Utah. The group, made up of three gentleman (think a younger, American version of The Three Tenors) featured Alissa in their debut music video for their single ‘Dare’. “A talented young dancer whose body told her she would never dance again, but she had other plans. At the young age of eight, Alissa lost her right foot in an unfortunate accident. She truly dared to dream and bravely made a return to her favorite past-time. May this music video serve as a powerful real-life example of that fact that the only thing that stands between you and your dreams is the decision to act. #DareToDream. Have the courage to chase it,” says the description of the video. In fact if you look at the press section on their website, the majority of news stories from around the globe focus on the fact they featured Alissa! “Having the opportunity to really inspire and positively impact other people was something that we really set out to do,” said Brad Robins from Gentri to a Salt Lake City news station.